– Good choice for the opening match. Considering Dolph is pulling double-duty for the evening, it is best to get his title defense out-of-the-way so he can recuperate in time for the elimination match later on. – John Morrison never stood a chance. O how the mighty have fallen. This may be the last time we ever see JoMo on a WWE PPV. I am sure he will have a bright future though as a future TNA World Heavyweight Champion. – The match itself was decent enough for an opening contest. Good work in the ring by both wrestlers. Dolph Ziggler might as well be named “Billy Mays” because he can sell absolutely anything. Nice ending with the knees up to block the Starship Pain of Morrison. 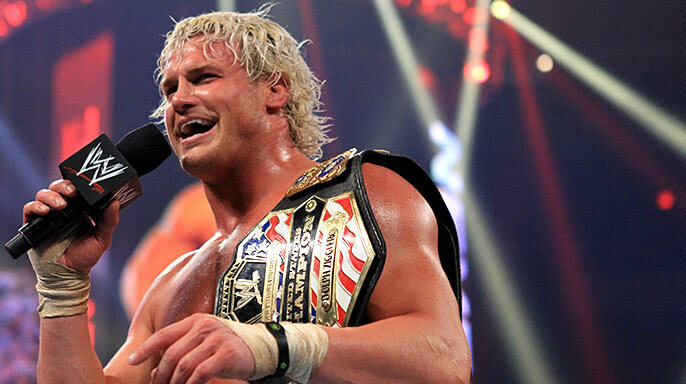 I am glad Dolph Ziggler won the match, but he needs to drop that title soon. He has gotten all he can out of being United States Champion. Time to move on to newer and better things. – Thank goodness Ryder made an appearance after the match, otherwise I believe the fans would have rioted. The “We Want Ryder” chants at the start of the match and during Zigglers post-match promo were deafening. It is insane how over Ryder has gotten with the fans. – Why was this match turned into a “Lumberjill” match? The Divas outside of the ring were barely involved. It was probably just a cheap way to get Maxim Cover girl Kelly Kelly some air time. – This match was just filler. It wasn’t given enough time to really mean anything to me or the crowd in attendance. – The finish to the match was the most exciting ending to a Divas match in quite some time. The top-rope Glam Slam looked very impressive and got a nice cheer from the New York City crowd. – It is good to see the WWE still showing some faith in Beth Phoenix as Divas Champion. I picked Eve to win this match in my predictions, but that is just because I believed the title reign of Phoenix was turning into a dud. Beth is still the best female wrestler they have, so it is good to see the title remain around her waist. – The right team and the right 2 guys won this match. If the WWE wants to push Wade Barrett and Cody Rhodes to the top, then they had to come out smelling like roses in this elimination match, and that they did. It was a safe bet these 2 would walk away as survivors when it became a 4-1 advantage for Team Barrett. – Randy Orton has now lost 3 of his last 4 PPV matches (Survivor Series, Hell In A Cell, Vengeance). Downward Spiral? Not at all. He is taking one for the company right now, making guys like Barrett, Mark Henry and Rhodes look like gold. That is why he has been at the top of the food chain for so many years. – Sin Cara appeared to legitimately hurt himself during this match. Rumor has it that he may require surgery that could keep him out of action for 6-8 months. As long as we don’t have another Hunico turned Sin Cara wannabe come up from FCW to replace the character, then I will be ok. With the countless botches, the wellness policy violation and now this injury, who knows if we will ever see Cara in a WWE ring again. – What was with the early exit for Dolph Ziggler? I know he wrestled earlier, but it would have been nicer to see him last just a tad-bit longer. – As far as Survivor Series elimination matches go, this was just about as average as they come. The Sin Cara injury disrupted the flow of the match, but if the injury was legit and not a work, then I guess that is unpreventable. The match also loses points with me for the early Ziggler exit and the Sheamus DQ. Match 4: The Big Show defeated Mark Henry by DQ via a Henry Low-Blow Mark Henry remains the World Heavyweight Champion The Big Show attacked Mark Henry in a post-match attack, injuring the Champions ankle with a Steel Chair. – For a match with 2 guys who both exceed 350 lbs, it sure did have its share of spots. The barricade spot came off looking strong, the superplex tease was a nice added touch, and seeing the Big Show deliver a top-rope elbow drop was something to behold. – I was glad to see that Daniel Bryan did not cash in his Money in the Bank briefcase. As soon as the attack of Henry occurred, the entire audience truly believed that “The American Dragon” would cash in his title shot. To see Bryan hold it until Wrestlemania would make him the first wrestler to ever last the full calender year, and that would be quite the accomplishment. – What becomes of the World Heavyweight Champion now? The Big Show was out of action for months because an attack that was similar to the one that just befell Mark Henry. Who knows what this means for Henry, the belt and his future. – I loved to see Howard Finkel come out and announce C.M Punk to the ring. Alberto Del Rio has Ricardo, so Punk having his own announcer (not to mention the most famous announcer in WWE history) was a nice touch and a nice slight at the champion. – This was hands down the Match of the Night. I may have been hard on Del Rio in the past for his character and how redundant and boring he can be at times, but he is one of the best in-ring performers, wrestlers and story-tellers the WWE has right now. I could have watched these 2 wrestle in that ring all night. The submission-style wrestling was a treat to watch, and a added bonus from a MMA filled evening the night before. It is good to see the Anaconda Vise still be used as an ends to a match. – You have to love the constant “Macho Man” Randy Savage elbow drop tributes by C.M Punk. This is a guy who respects the past and knows the history of this company and the industry he works in. Savage was one of the all-time greats, and his legacy now lives on through Punk. – C.M Punk winning the WWE Championship was the right move. The reign of Del Rio wasn’t going anywhere, and Punk was hitting a stand-still of his own. He is arguably the most over guy in the WWE right now, and it seems that winning the title truly meant a lot to him. He is back on top of the ladder where he rightfully should be. – The tag-team in-ring psychology of Miz and Truth was very effective. I truly believed that they had a shot at winning this match, compared to the 2 guys across the ring who have true disdain for one another in Cena/Rock. – Despite the fact that he has been out of action for 7 years, The Rock came off looking like he hadn’t missed a beat. He appeared to be in great physical shape, and nailed all of his signature moves with the same precision and physicality he had years back. – The clean pin by The Great One disappointed me a bit. With all the hype surrounding the match, I figured they would try and do something a bit different from the norm, but I guess we all can’t what we want sometimes. Nonetheless, seeing the Peoples Elbow and The Rock throwing his elbow pad into the crowd was awesome. – No heel turn for John Cena tonight. It was nice holding on to that dream for a few weeks that the WWE would pull the trigger on a heel Cena. However, just because it didn’t occur tonight, doesn’t mean it couldn’t another date time before Wrestlemania 28. The Rock giving a Rock Bottom after the match to Cena could be putting more fuel to the flame for my heel turn theory. Considering all the hype, money and publicity put into this event, I feel like it let me down just a little bit. The ending to the World Title match was cheap, the Divas title match meant nothing to no one, and the end to the entire show with The Rock and Cena just lacked any true substance. I did like however the surviving of Barrett and Rhodes, as well as the WWE Championship title switch. If anything made this PPV more bearable, it was the NYC crowd. Their chants throughout the night were some of the most entertaining moments of the show. Even with all of that, I believe a lot more could have been done to this card and to the show itself to make it memorable. In the end, it was just a basic WWE PPV, and that’s even with the return of the Rock. This entry was posted in WWE. Bookmark the permalink.